As discussed earlier, India has tribal communities across its length and breadth. Almost each of the states in India is home to some or the other tribal groups that only enrich the cultural heritage of the country. Right from Himachal Pradesh, Haryana and Chandigrah in the north to states like Andhra Pradesh, Karnataka and Kerala in southern India, there are tribes in every corner of India. Visiting these tribes really proves to be an interesting experience for travellers. Even the islands of Andaman and Nicobar and the Lakshadweep islands are fine places to observe the tribes of India as they go about their daily routine. 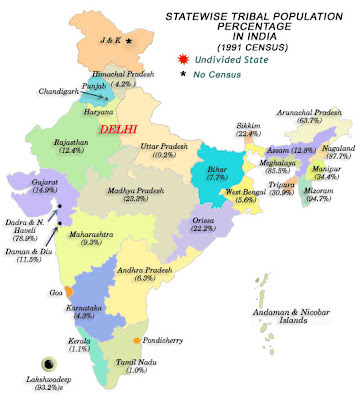 Given below is a map that shows the tribal distribution across India. The percentage of tribal population is given as per the 1991 census.